WATERLOO, ON – Brick Brewing announced today that they have received a Statement of Claim from Anheuser-Busch and Labatt (both part of the multinational brewing company AB InBev) claiming that the Waterloo brewery’s recently launched Red Baron Lime infringes of Bud Light Lime trademarks and copyrights. Red Baron Lime is one of several lime-flavoured beers launched by breweries across Canada this summer in an attempt to capture market share from the popular import Bud Light Lime. 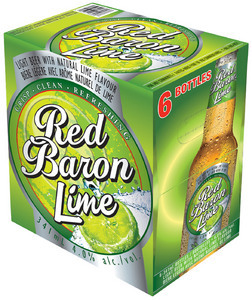 Brick has been marketing Red Baron Lime as both a cheaper and locally brewed alternative to the Anheuser-Busch product, which is brewed in the UK and US, and distributed in Canada by Labatt. Among claims made in the suit are that the Red Baron Lime label uses images of limes and the colour green, and that lustforlime.com, the website promoting the beer, uses images of young people wearing swimsuits. This is the second lawsuit issued against Brick by Labatt this year. The first, which claimed that the packaging on Brick’s original Red Baron lager was too similar to Brava, a beer brewed by Labatt subsidiary Lakeport, was issued in May and settled out of court in June. A lime beer’s packaging using images of limes – imagine that. One might almost guess this lawsuit is an abuse of the legal system intended to intimidate small competitors. That is, of course, clearly not the case.